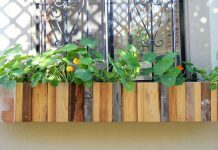 From tending raised bed gardens on rooftops to growing select vegetables in a 5-gallon bucket (more commonly known as a 5 gal bucket) in backyards and balconies, urban gardening is increasing worldwide. As the population of the world moves more and more towards urban settings, the practice of gardening transforms to fit the diverse environment of cities. How Much Does a 5 Gal Bucket for Urban Gardening Cost? As crazy as it may sound, traditional gardens are pretty much a thing of the past. Investing in containers for urban gardening such as 5-gallon buckets is the new norm. If you slow down and pay attention, you will probably notice a few 5-gallon bucket garden containers in a backyard or on an apartment balcony near you. There is an unlimited number of ways to modify your "5 gal bucket" into a great garden container. Knowing what you will do with one is essential if you want to purchase the best bucket for your particular urban gardening needs. Urban gardening is a mixture of techniques and strategies employed to grow vegetables, fruit, herbs and other plants in urban areas such as large cities. Due to the nature of the thing, each urban garden is unique. 5-gallon buckets are commonly placed on porches, balconies, patios, and in yards. Depending on the purpose of the garden, anywhere from one or two buckets, up to several dozens of buckets may be necessary. A single 5-gallon bucket dedicated to growing vegetables is enough for one of two people to enjoy a steady supply of plants each year, while several buckets growing vegetables and herbs can significantly reduce the amount of money spent on veggies and spices for an entire family each year. There is a healthy amount of plants commonly found growing in buckets. Tomatoes are perhaps the most popular plant produced in a 5-gallon bucket. There are a couple of dozen buckets in my garden just for that purpose. Peppers, onions, carrots, beans, squash, spinach, cucumbers, radishes, melons, beets, broccoli, potatoes, lettuce, various berries and other different fruits, vegetables, and herbs. All of these are perfect for growing in buckets. The average 5-gallon bucket is capable of producing a single tomato plant, pepper plant, melon, herb, eggplant or squash. Three to four beets, heads of lettuce, and onions fit into a single 5-gallon bucket as well. If you decide to go in a different direction, there is room for 10 to 12 carrots, radishes, and small onions. Start by purchasing or otherwise acquiring the right number of food grade 5-gallon buckets for your project. Most home improvement stores such as Lowe’s and Home Depot carry a wide variety of buckets. You can also find them online. The first thing you’ll want to do with your bucket is to create proper drainage holes in the bottom. Do this with either a drill or a hammer and nails. One hole every couple of inches or so will give your bucket an excellent drain. If you’re worried about the appearance of your bucket, you can purchase a colorful bucket, paint it, or disguise it by placing it inside a larger decorative container. You can also cover the bucket with some aesthetically pleasing fabric. Next, place a few handfuls of rocks and gravel into the bottom of the bucket. Make sure you fill the bottom of the bucket with at least two or three inches of gravel and rocks to ensure proper drainage. Add a mixture of half potting soil and half peat moss, and you’re ready to plant. Select the seeds or plants you want to grow in your bucket garden, accurately place them, add water, and watch them grow. For the best results possible, water your plants regularly and add fertilizer to your soil every so often as well. Before moving on to the top ten 5-gallon buckets, let’s take a look at some of the most frequently asked questions about urban gardening. What are the benefits of urban gardening? The benefits to urban gardening are quite significant. Among them are access to fresh quality food, promotion of a higher quality of life, and improved local sustainability. Urban gardens offer a natural world of resources to city dwellers without access to farmland and traditional garden space. What are the most common techniques for urban gardening? Urban gardening consists of, for the most part, the same techniques as traditional farming. 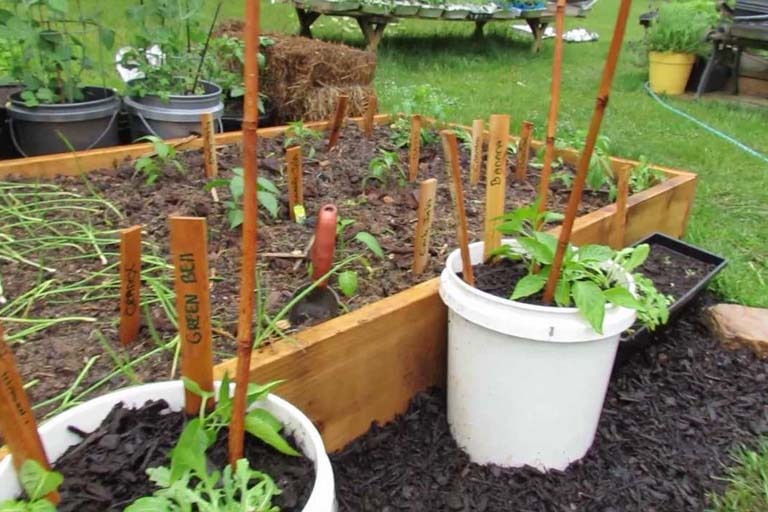 The significant difference is that in urban gardening, people use various containers in place of rows in a field or backyard garden. 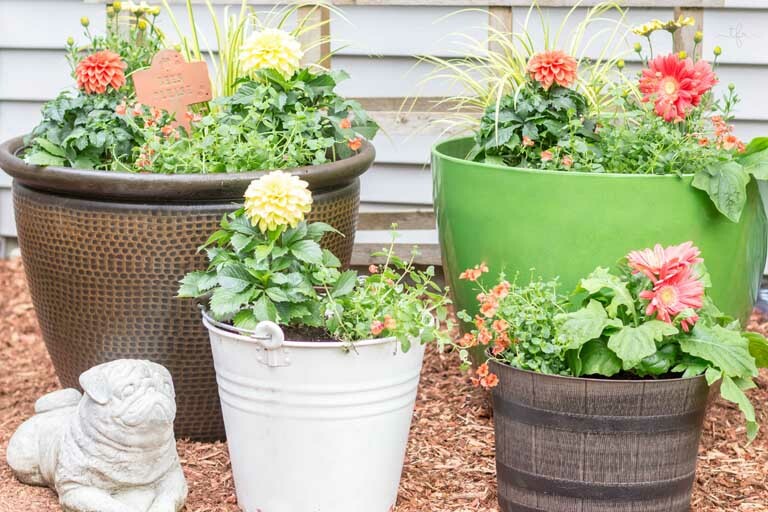 Some of the most popular types of containers used in urban gardening are wading pools, tires, feed sacks, 5-gallon buckets, and other various sized pots, bags, and buckets. How much sun does my urban garden need? Your urban garden needs to get at least six hours of full sun to grow most vegetables successfully. Several specific types of crops such as beans, peppers, and tomatoes, will require additional sunlight. Are urban gardens legal in the United States? Urban gardening is legal in most of the United States. 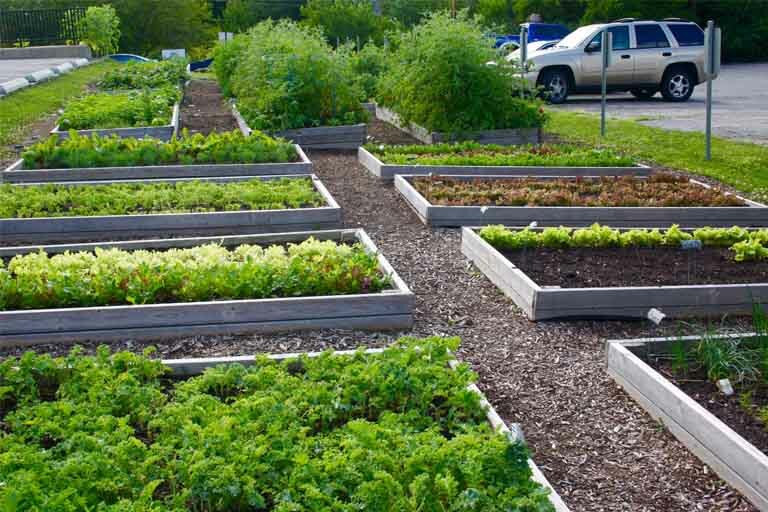 However, there are a few areas that make it hard for people to grow food in their yards. This can be due to either a residential garden ban by city or county officials or front yard gardening bans by neighborhood homeowners associations. Before creating a garden of any sort, it is best practice to check local ordinances first. What do I need to get started with 5 gal bucket gardening? There are countless ways to utilize a 5-gallon bucket for gardening. The fastest approach is taking the bucket, adding a small amount of gravel to the bottom, filling the bucket with soil, and planting whatever you want to grow. Place the bucket in a spot where it will receive plenty of sunlight, keep it watered, and you’re in business. 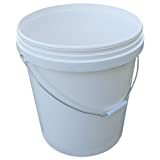 You can purchase the best 5-gallon buckets online through Amazon and eBay, or at local department stores such as Home Depot and Lowe’s. Most 5-gallon buckets fall into a general price range of $5 to $30. However, buying in bulk can lower the price down to less than $3 per bucket. There are also high-end buckets that cost well over $50 a piece. To deliver the best selection of 5-gallon buckets to our readers, we delved into some serious research. We looked at urban gardening forums, review sites, informational videos and more. Then, we sorted through numerous product descriptions from retailers and manufacturers, as well as customer reviews and ratings. What we collected was a massive amount of up-to-date information about 5-gallon buckets for gardening, which allowed us to put together the following list. Here’s our list of the top 5-gallon buckets for urban gardening to purchase in 2018. We’ve also included a few alternatives to simple standard 5-gallon buckets as a bonus. You’ll find a summary for each product including features, prices, ratings and warranty options for each item. The list is in no particular order. This premium bucket from Hudson Exchange is available individually or in packs of 6 and 12. It comes in various colors including black, yellow, green, blue, red, white and grey. The bucket is taller than most, as well as having a tapered stackable design. 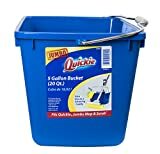 This blue 5-gallon bucket is available on Amazon. It has a rating of 4.6 out of 5 stars due to Amazon customer reviews. The price range is $10 to $20. This All-American bucket consists of high-grade 70 Mil plastic. It is pale white, comes with a handle, and is stackable. Used by contractors and homeowners for everything from gardening to painting supplies. The Encore Plastics bucket is available in 3.5-gallon size as well. The Encore Plastics 5-gallon bucket is on Amazon where it has a 4.4 out of 5 stars rating by customer reviews. This items price range is $15 to $25. All buckets are BPA free Food-grade Plastic. This seven-piece food grade white bucket kit comes with assorted color gamma seal lids. Made of plastic resin, the buckets are manufactured in the United States and the materials are also from the United States (if buying American is important to you). Free shipping comes with the purchase of this seven pack. You can pick up this 5-gallon bucket kit online via Amazon. It has a 5 out of 5 stars rating and a price range of $135 to $145. The Homer Bucket is another favorite 5-gallon bucket for gardening. It’s available from Home Depot and Amazon and has one of the lowest prices currently on the market. This bucket is a standard all-purpose 5-gallon bucket painted in orange with the Home Depot logo. They don’t get much more basic than this. This three pack of 5-gallon buckets from Hudson Exchange is available on Amazon. The product has a 5 out of 5 stars rating by Amazon customer reviews. The buckets have a price range of $35 to $45. These six buckets consist of food safe polyethylene that meets all USDA, UFC, NMFC, and FDA regulations. They’re a heavy duty 90 Mils thick. The buckets weigh two pounds each and are 12 inches wide and 15 inches high. These buckets are safe for storing food as well as for growing just about anything. You can purchase this six-pack of 5-gallon buckets from Amazon. They have a rating of 5 out of 5 stars based on Amazon customer reviews and a price range of $55 to $65. Another primary 5-gallon bucket which is great for urban gardening is this premium green bucket from Hudson Exchange. It is ribbed, stackable, and taller than most 5-gallon buckets. 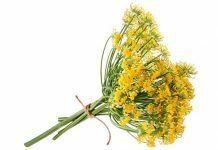 It can hold fluids of up to 190 degrees hot although that would be extremely unhealthy for your plants. Fair warning. This bucket is perfect for an urban garden with a green theme. This green 5-gallon bucket is available through Amazon. It has a 4.6 out of 5 stars rating and a price range of $10 to $20. The Berkley bucket with handle is for transporting gear for fishing, but it works great as a modified garden container as well. This is a very basic bucket with the addition of a high-quality UV and corrosion proof rope handle. Perfect for a portable garden container. 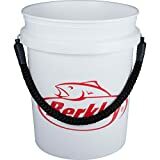 The Berkley 5-gallon bucket with rope handle is on Amazon where it has a rating of 4.7 out of 5 stars. The containers price range is $15 to $25. The FarmTek bucket is another container which is ideal for urban gardening. It’s made of high-impact plastics and is exceptionally durable. It comes with a steel wire handle and a plastic handgrip. There are lids and insulated bucket holders available for these buckets as well. This bucket is available for purchase on Amazon. The container has a 4 out of 5 stars rating due to Amazon customer reviews. Its price range is $10 to $20. For those who’re in search of something a bit more heavy duty, the YETI may be the one for you. This bad boy is actually an impact resistant fishing utility bucket, so it's practically indestructible. It’s also food safe and comes with an easy to use and comfortable handle. You can pick up this mighty bucket on Amazon. It has a 4.8 out of 5 stars rating and a price range of $35 to $45. The Quickie Cleaning Caddy is not your ordinary 5-gallon bucket. However, it does measure 20 quarts, it has a square shape rather than round and comes with a comfortable handle. It also doubles as a storage container for odds and ends. Although it is not circular, it is still just as useful as a garden container as any other bucket on the list. In fact, if you have limited space to grow, like a small balcony, a square container might be your best bet to maximize your growing area! You can pick up one of these 5-gallon bucket cleaning caddies on Amazon. It has a 4.5 out of 5 stars rating based on Amazon customer reviews and a price range of $10 to $20. When it comes to purchasing the best 5-gallon bucket for your urban gardening needs, there are a few things you’ll want to remember. First, no matter what you're going to put in it, a bucket is just a bucket. That said, a bucket is the same as an artists’ canvas. Meaning, the possibilities of gardening with a 5-gallon bucket are endless. The more imagination you have, the more productive each bucket you invest in will become. The Hudson Exchange Premium 5 Gal Bucket is the best all around 5-gallon bucket for urban gardens. These buckets are taller than most, have a colorful and aesthetically pleasing stackable design, and all at a fair price. They’re available individually as well as in half dozen and one dozen packs. 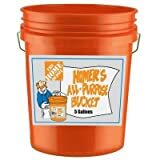 The Homer Bucket from Home Depot is another excellent choice for urban garden projects which require a more significant number of individual buckets. With a more than reasonable MSRP of $ 2 to $3.25, these buckets drop to the ridiculously low price ranging from $2 to $2.50 per bucket when you buy several dozens at once time. Do you know about a 5-gallon bucket for urban gardening that should have appeared on our list? We’d love for you to share with our readers in the comments box below!